Hazard: The iced tea maker’s components can fail, posing a fire hazard to consumers. Description: The recalled Iced Tea Maker (Model #IT400) is mostly white and has a 2.5 quart glass pitcher. The recall includes only those products with a date code of CA1307 or CA1307-A. The model number is embossed on the bottom of the unit, and the date code is printed on a small white sticker, which is also on the bottom of the unit. Sold at: Bon-Ton department stores and hardware stores nationwide, the JCPenney catalog, and Internet retailers from April 2007 through July 2007 for between $40 and $50. Remedy: Consumers should stop using and unplug the recalled iced tea makers immediately and contact Back to Basics Products to receive a free replacement product or refund. Importer/Distributor: The Hayes Company Inc., of Valley Center, Kan. Hazard: The candle's wax can catch fire causing a high flame, which poses a fire and burn hazard to consumers. Incidents/Injuries: The firm has received two reports of consumers who suffered minor burns to their hands when they tried to extinguish flames coming from the candle. 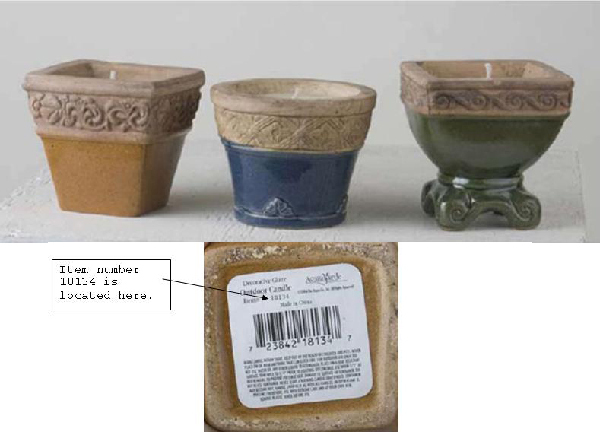 Description: The recall involves three styles of outdoor citronella candles with a glazed lower portion that is brown, blue, or green. The item number 18134 can be located on the top left part of the label on the bottom of the candle. Sold at: Ace Hardware stores nationwide from February 2006 through June 2007 for about $8. Remedy: Consumers should stop using the recalled candles immediately and return them to any Ace Hardware store for a full refund. Consumer Contact: For further information, contact Hayes at (800) 838-5053 between 8 a.m. and 5 p.m. CT Monday through Friday, or visit the firm’s Web site at www.hayesco.com. Retailer: QVC Inc., of West Chester, Pa. Distributor: Salton Inc., of Lake Forest, Ill. Hazard: The toaster can turn on without bread in the slots and ignite items placed on top of it, posing a fire hazard. Incidents/Injuries: QVC has received information that ten toasters reportedly turned on spontaneously, including one incident of fire damage to kitchen cabinets and two incidents of toaster covers burned. No injuries have been reported. Description: This recall involves the “Cook’s Essential” four-slice wide slot electric toasters model CET 401. 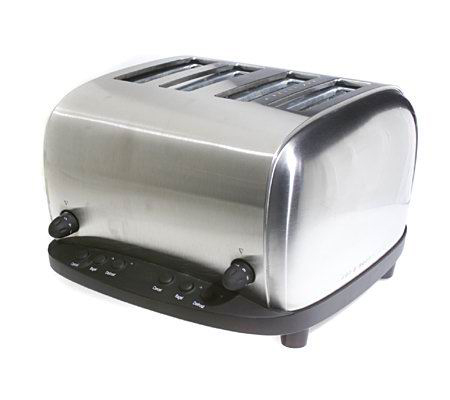 These toasters are made of stainless steel and measure 12 inches long, 13 inches wide and 8 inches high. Each toaster has “Cook’s Essentials Classic Look Toaster, Model: CET401” printed on a plate located on the underside of the toaster. Sold by: QVC through its television station, its Web page; its toll-free number, outlet, and its employee and Studio stores from January 2003 through June 2003 for between $63 and $69 plus about $8 for shipping and handling. Some recalled toasters may have been sold at various retailers. Remedy: Consumers should stop using the toaster immediately, unplug it, and cut off the power cord where it enters the body of the toaster. Consumers who return the power cord in the prepaid envelope that will be provided will receive a full refund.